Rawalpindi: The three-day event Millennial Model United Nations – MMUN 2018 was declared open at The Millennium Universal College (TMUC), Bahria Springs, Phase 7, Bahria Town, here last day says press release. 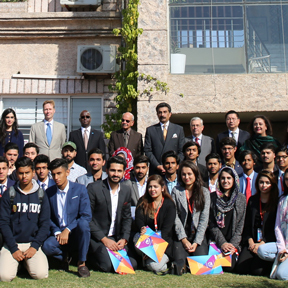 More than 1000 students from across Pakistan participated in this event.The ceremony was presided over by Rolf M. Hey Holmboe Royal Danish Ambassador in Islamabad and Chief Operating Officer Anna Faisal and Principal TMUC Bahria Springs Shabana Jaspal. Chief guest Rolf Holmboe in his speech to the delegates and all other present expressed his pleasure to witness the event and stressed that education is the best investment concerning the future of the country. He emphasised on understanding of the role of the United Nations in addressing pressing global issues. The opening ceremony was followed by a noteworthy Ambassadorial Moot moderated by Ambassadors from around the globe representing United Nations member states, Joao Sabido Costa Ambassador of Portugal in Islamabad, Rolf M. Hey Holmboe Ambassador of Royal Danish Embassy in Islamabad, Ali Sheikh Abdullahi Deputy Head of Mission in Embassy of Somalia in Islamabad, Ambassador Ghalib Iqbal Former Pakistan’s Ambassador to France, Ambassador General (r) Asad Durani Former Pakistan’s Ambassador to KSA and Germany, Author & Former DG ISI and Chen Xiang Director China Radio International, Islamabad. The moot is an extra ordinary platform to discuss the most important and sensitive issues and this year the topic of the Moot debate was “Peace & Progress through Partnership and Connectivity”. The Ambassadors introduced themselves to the audience consisted of the entire Millennial Model United Nations Executive Council and Delegation and educated them on the role of the United Nations, its purpose and goals in achieving global peace and prosperity. The Moot was hosted by Recruitment & Outreach Manager Ms. Alifia Rizwan and moderated by Ghalib Iqbal Former Pakistan’s Ambassador to France who shaped the Moot to enable the youth with a significant opportunity to speak with the Ambassadors and Diplomats. The foreign diplomats were highly pleased and appreciated the encouraging thoughts of the delegates and insisted them to utilize talents to make positive contributions to their society. There were a series of questions asked by students. One of the millennial asked if world peace is actually attainable. Ali Sheikh Abdullahi responded in a much optimistic manner stating that if the UN as a platform is utilized to its optimum world peace is attainable. The Ambassadors commended the delegates on their intellectual and well thought out questions and concern not on national issues but also on the global scenarios. Chief Operating Officer Roots Millennium Education Anna Faisal, Director Outreach and Communications Sabina Zakir & Principal Ms. Shabana Jaspal gave mementos to the Ambassadors and representatives of the countries.